"Dedicated to the advancement of responsible care and use of laboratory animals through education, training and information exchange for the benefit of human and animal health"
Questions? Use the FAQ page. Note for Bundle Administrators - Information on setting up your group membership is available here. 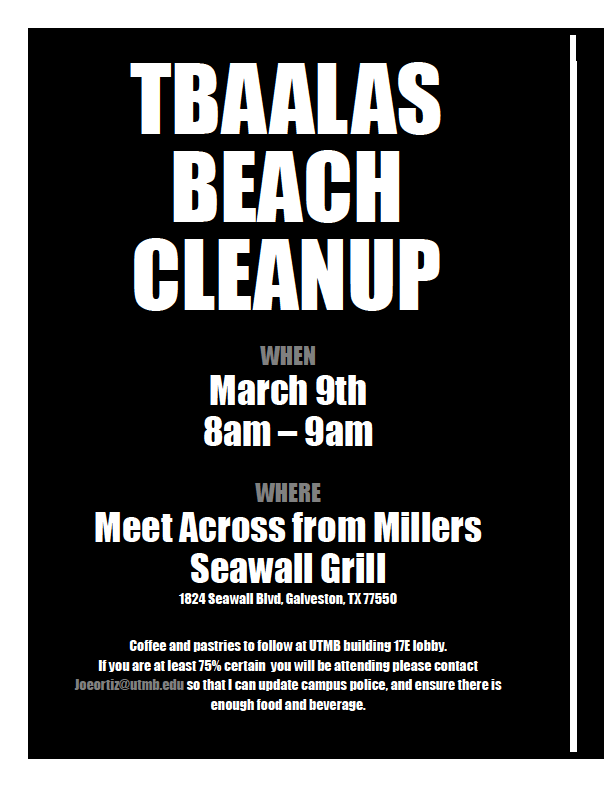 Join TBAALAS members at the TBAALAS Beach Cleanup! Check out the latest job postings here. Texas Branch Fun Fact: It's a 12 hour drive between member institutions in Galveston and El Paso. 797 miles! Membership keeps you in touch with colleagues, and helps you develop your professional network. You get access to the AALAS Learning Library (included with your membership)! See all the other advantages of Branch membership here. Texas Branch On-line Store is Open! TBAALAS and TSBR are now on Facebook. Get invited by a Branch member or request at Texas Branch AALAS on Facebook. Congratulations to John Donaho, Assistant Director at the Center for Laboratory Animal Medicine and Care at UT Houston, for being named the Purina Lab Diet 2018 Laboratory Animal Technician of the Year. He joins a select group of distinguished former award winners, many of whom attended the award ceremony in Baltimore. WOW! Congratulations to the M D Anderson Cancer Center and Dr. Jim Allison for winning the 2018 Nobel Prize in Medicine! Did you know about the Town Hall feature on Facebook?